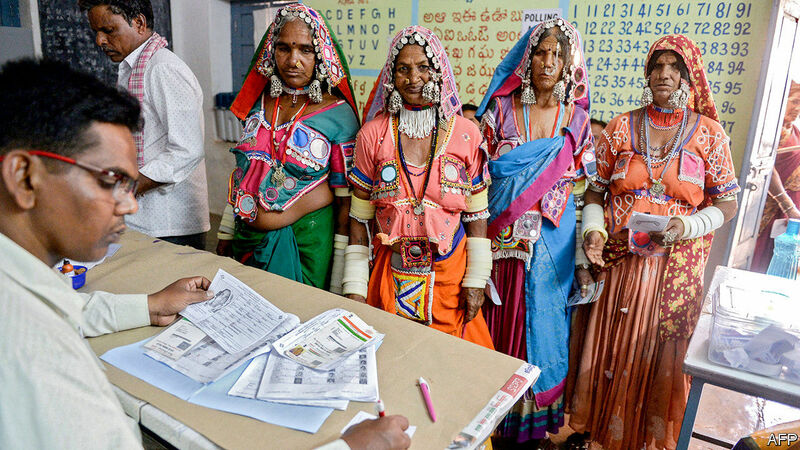 ALMOST ONE in eight of the world’s adult population is eligible to vote in the election for the next Lok Sabha, the lower house of India’s parliament. Something close to one-seventh of them were invited to vote today, April 11th. The rest of the nearly 900m people who may choose to exercise their franchise will wait their turn over the course of the next 37 days, in a series of six more phases. 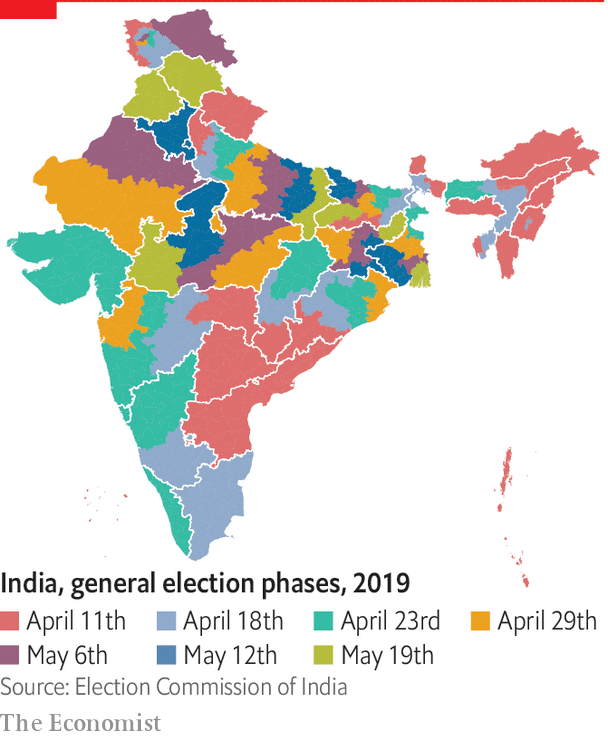 They are staggered, such that about six days pass between each round, and scattered all over the country, in a splotchy-looking map that the Election Commission of India has calibrated carefully. One effect is that no one will know who won any given seat—let alone whether the prime minister, Narendra Modi, keeps control of the government, or lets it slip to some unfathomable assembly of opposition parties—until May 23rd. That morning all the ballots are to be counted within just a few hours. Why draw out the voting like this? The seven-phase calendar imposes practical difficulties of its own. There are strict rules that are supposed to prevent news of polling in any one area from affecting the voting decisions made in another. (Let’s never mind the bated breath of a billion-odd people waiting for an outcome.) But here is the catch: those same strictures, the “model code of conduct”, are what make the slow and steady pace necessary. The code is implemented by a roving company of administrators, backed up by an enormous number of police and paramilitary forces. Getting from one part of the country to another takes time; some of India’s 1m polling stations are still extremely remote. The whole state of Arunachal Pradesh, next to the border with Myanmar, voted today, which meant that 32 officials had to be airlifted into a deep forested valley. The Election Commission is nowadays most concerned with ensuring a fair and well publicised vote, but in wilder times it was also responsible for protecting ballot boxes from being stuffed or stolen, or candidates kidnapped. Look at the map to see what role security considerations still play in determining the need for seven phases (in the last general election, there were nine). Several of the states that went to the polls today managed their voting in one go: Arunachal in the north-east, Telangana and Andhra Pradesh around the south-central Deccan plateau, and Uttarakhand in the Himalayas north of Delhi. These are all relatively peaceful places (notwithstanding the odd Maoist attack in the south). By contrast the northern and eastern states of Uttar Pradesh, Bihar and West Bengal, across the most densely populated and also the poorest belt of all, are broken up into seven parts each. They are also notorious for their rough-and-tumble politics, and the thuggery that comes with it. The Kashmir valley in the far north is not nearly so thick with people, but its security problems are even more intense; it is the other place to keep the commissioners busy through April and May. The staggering is the one thing that has brought the Election Commission the least criticism. In this fevered season opposition parties, NGOs and other observers all see the tables being tilted against them. Every day brings a new complaint, and sometimes even redress. On April 10th the commission ruled that a hagiographical film biopic about Mr Modi cannot be released until after the election, and also that “NaMo TV”, a mysterious new satellite channel, must be counted as pro-Modi advertising. Such enforcement of the model code will continue through the election itself. On April 12th the Supreme Court is to decide whether “electoral bonds”, a new method of funnelling corporate donations anonymously into party coffers, should be voided midway through the voting. Lots of work left to do, only 37 days and counting. NextHow does the World Bank work?